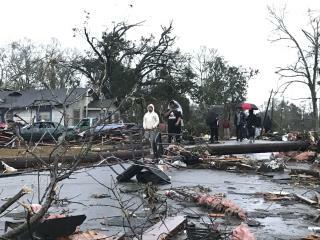 (Newser) – Four people were killed and scores of homes were flattened early Saturday when a tornado ripped through the Hattiesburg area, officials in Mississippi said. The city of Hattiesburg said via its Twitter account that four people had died after the twister blew through the city and surrounding area. The AP reports Mayor Johnny DuPree has signed an emergency declaration for the city, which reported "significant injuries" and structural damage. The city also said via Twitter that Hattiesburg firefighters and police are going door-to-door to try to rescue victims. Greg Flynn of the Mississippi Emergency Management Agency said rescuers are still searching the stricken area for more possible victims. Man that's half of Hattiesburg? More proof that God hates Republicans. Only 4? Come on MAMA NATURE, you can do better than that.